Put up a statement in each corner of the classroom: A: ‘I meditate regularly.’ B: ‘I would like to learn to meditate.’ C: ‘Meditation is for yogis.’ D: ‘I have my own ways of relaxing.’ Ask students to go to one of the corners and then justify their choice. This can be done in corner-groups, or as a whole-class activity with the teacher ‘interviewing’ some of the students. Do a quick brainstorm on situations that can be stressful. (E.g. exams, being late, getting lost, missing your flight) Then ask your students to recall the last time they felt stressed out. Give them a few minutes to bring the experience back to mind. Then they share their stories in pairs or small groups. Note: You might want to demonstrate telling your story to the whole class first. It’s easier for the students to share personal stories after the teacher has set the scene for this. In addition, you can feed in some useful language. Pause the clip after each unit of speech and ask your learners to hear the echo with their inner ears. This focuses their attention and increases retention. Do this for 1-2 minutes. Watch part of the clip without sound and pause for a few second with each main caption. Let your students read the text and let the language sink in. This is particularly suitable for a 2nd watching. 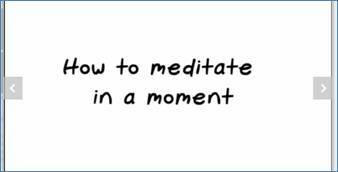 Ask them how they felt, what they experienced during the one-minute meditation. They can share in pairs first, and then volunteers can make comments in whole-class mode. Check understanding of key vocabulary, language chunks. E.g. feel stressed / feel anxious / have trouble (sleep)ing / sit straight / rigid / focus on your breathing / notice / a balanced position / get distracted / feel refreshed / feel a bit more awake / state of mind / it takes a minute. Ask your students to recall the definition given for ‘a minute’ (‘A moment with handles on it’). Give them two minutes to come up with similar alternative definitions for e.g. day, life, hour, evening, morning, night etc. Appreciate all the ideas. Trigger question: How does the message of the video relate to wider social, economic, environmental issues? Can your state of mind influence the way you see things? Note: These questions may not elicit an immediate response. Sometimes it can be thought-provoking to just raise a question and allow it to work on our minds.